Honestly, I never expected to enjoy a sci-fi series this much. 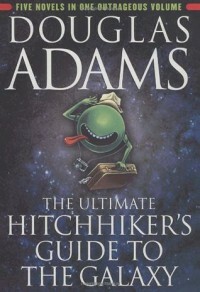 The Ultimate Hitchhiker's Guide includes the five novels from the series, as well as a short story containing characters from the novels. Douglas Adams takes his eclectic cast of characters on humorous, over-the-top adventures through time and space, both in this galaxy and beyond. His creativity is what makes the series so enjoyable. Additionally, he touches on almost every aspect of human nature: love, power, greed, loneliness, wanderlust. The series will take a while to complete; but once you've finished it, you'll be disappointed it's over.